My Wordless Wednesday post was a gruesome scene of scratcher destruction, I hope was not too much for the more sensitive of you to see. I had been planning on telling the tale of woe that had besieged that poor scratchy for a long time. The time has finally come! We got this awesome scratcher/lounger the day before we got Leo. We had driven 8 hours to get him from Chrystal and Winnie's Wish and Greg, for some weird reason, decided to see what the store close to our hotel had to offer. I, myself, decided it was time for a nap! He found that scratcher, and a few others just like it, on clearance and he bought them all. We kept the one and gave the rest to Winnie's Wish. Of the things we brought home from that trip, this was the one thing Star had approved of. Star: This, we can keep. The barbarian has to go. I'll pause for a moment so you can admire what a beauty she was, and so I can wipe my eyes at typing 'barbarian' once again for old time's sake. Over the years, the scratcher took a lot of abuse, as scratchers are wont to do. But then I noticed that the damage was not coming from simple scratching! I saw Cashmere gnawing on a corner once and decided that she must be the culprit. Then I saw Glitter laying amid discarded pieces of the green edge and assumed it was her. She always seemed to be laying in the mess, so it was an understandable assumption, right? While it is true that no box is safe with Cashmere around, I never again saw her gnaw on the scratcher. And Glitter had never been caught in the act, or even with tell tail incriminating evidence on her lips. So perhaps I was wrong..
And then, I caught him red handed pawed! Leo: *chomp chew spit nibble tug* This is so awesome..
Leo: I can rip this apart day and night and my sissies get the blame! Bwahaha! Leo: ...Oh, wow.. Hey, have you seen this mess? I was just contemplating which one of the girls did it. I think we should take a cast of their teeth to test against this, don't you? I mean, clearly this is the work of a master criminal and I'm much too sweet and quiet and gentle to be a master criminal. I can see you thinking about not believing me, and I am offended! Then we came to this destruction! The top ripped off of the bottom, a whole arm ripped off of the couchy part, and not much left of that couchy part at all! Cardboard bits everywhere! Oh the humanity! Catanity? It kept getting smaller and smaller and for some reason Greg was loath to throw it away. Even after we got a new scratcher! (which is still in one piece if you can believe that!) When it was down to a small section of the base, I caught this going on, half hidden behind the chair..
Leo: Star Trek on? check. Room semi dark? check. Totally hidden behind the chair? Check! It's chawin' time! Leo: *gnaw gnaw chew rip* Oh this is so good..
Leo: *patooie* Got lots o' cardboard stuck in muh teef! Um.. hey, did anyone hear a camera? Time to go! It's gone now. Laid to rest with untold chewed up cardboard boxes and fang shredded newspaper ads. Alas, poor scratchy lounger, we knew ye well. And gnawed ye well! I'm going to be adding more items to the auction later today or tomorrow. I'll post an update here when I do. I am also going to be seeing if there is anything I can do about the high postage on the art prints. The post office said those were the best prices they could give, but I think it's all in the packaging. I don't want any of them to break. I was sure that most of them would not fit in a flat rate box, but now I'm not so sure. Those are still expensive, but maybe we can do better. They are so gorgeous! I don't want anyone to miss out on owning such pretty pieces because of the postage. There are many items still without bids, so be sure to check them out! Every bid on the auction helps the kitties of Winnie's Wish! They are over full right now, and with so many cats, there are so many expenses! So please, if you see something you like, bid! If you don't see anything you like, perhaps you can make a donation? There's a button on the Daily Dose sidebar!. There's also a link to their Amazon Wish List if you feel like sending some much needed items! If you don't already have it, you can buy Chrystal's book, sales of it go to the kitties too! There are many ways to help! And don't forget adoptions! Share a kitty and ask your friends to do the same and we can get them into wonderful homes! Insta-Auction, new items all the time! There is only one thing better than a fluffy kitty tummy. And that's a fluffy kitty tummy that you can pet!! While Leo will not allow tummy rubs,* both of the girls not only allow them, they beg for them! The girls lay directly on me for tummy rubs, making it difficult to get a picture. Making it difficult to breath through all the fluff too! But that's not the kitties' concern! Glitter, especially, is fond of the two-arm-wrap-around-bear-hug-tummy-rub. Cashmere prefers the lay/lean on and/or next to you and squirm tummy rubs. And both of them love tummy rubs from their daddy! And THOSE pictures, I can get! Glitter: Chin and tummy, that's a good start, daddy. Glitter: Ah, the long pet, that's good too. Glitter: Long pets with chin scritches, that's best of all! Cashmere: I have to agree, two hands is better than one! Cashmere: With a good tummy rub, you can really zone out..
*Ok, I can rub Leo's tummy under a very specific set of circumstances. He must be sleeping on me, and so comfy that he rolls onto his back and I have to pretend that I'm only holding said tummy to keep him from falling off. Awesome items just waiting for your bids! Every bid helps Winnie's Wish! Someone, I won't say who, slammed the towel drawer in our kitchen a little too hard and the front popped off. It can probably be fixed, but someone, I won't mention who, never has time for little projects like that. By the way, those someones were not the same someone, but I'm still not saying who. ;) So anyway, the front has been off for ages but it still holds towels. When the drawer gets emptier, it's basically a big gaping hole with a few towels lining the bottom. Does this seem inviting? Does this seem interesting? I sure don't think so! Glitter: I explain nothing. You may leave now, and take that camera with you. I couldn't begin to explain it. No idea how she got in there, how she thought she'd fit, and how she can possibly be comfortable enough to stay! She's not a tiny cat and that is not a big drawer! Just exactly the width of a folded kitchen towel! One more: when she got in there, how in the world did she manage to turn around to face out?? I give up, if you know anything, please enlighten me. I'll be leaving now, taking the camera with me apparently. I don't trust the wrath those eyes promise..
Did you see the auction over the weekend? New stuff was added! And lots of awesome stuff still without bids! Every bid helps the kitties of Winnie's Wish! They are overfull at the moment which means lots of expenses! 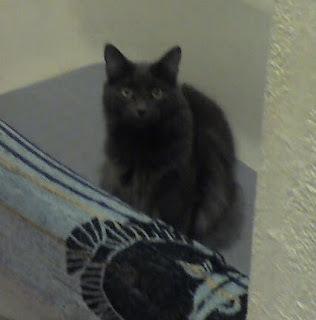 Not to mention one very sick kitten who needs lots of vet care and medicines. So if you don't find anything to your liking on the auction, consider a direct donation or checking out the Wish List, links to both can be found on the sidebar of Daily Dose! Oh, and adoptions are obviously greatly needed, so if you know anyone looking for an awesome kitty or two or three, you know where to send them! This is called Moasic, looks like tiles, doesn't it? This one is Ripple, and I love it because it looks like someone got at Leo with a hair crimper! The original. He fits just right, doesn't he? I have added several art prints to the Winnie's Wish Insta-Auction Site. They are so awesome! Most are in frames with matting and glass. The only drawback to them, and I am sorry for this, is the cost of postage. We took a sampling of them to the post office, packaged up, to get weights and postage rates and I was very shocked at how much, even in the US. A dear friend of Winnie's Wish and Chrystal's donated them, and I am thankful for all of it. I know that somewhere out there someone will love them enough to bid even with the postage rates. Here's a peek at a few of them, just to whet your appetite. There were other, non-art, items added today as well! Stop by and have a peek at the new stuff and older items as well! Or TBT as it's called! 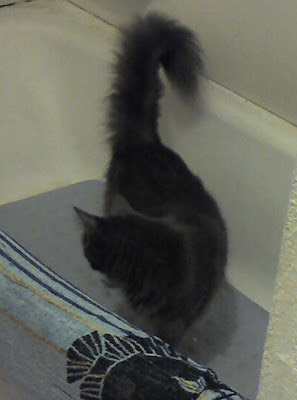 This was a surprise, there was a furry presence in the tub, and it wasn't due to my poor housekeeping skills! I heard 'tub toys', where are they?? Oh, you said tub boy? Rats, I thought there were new toys in here. I guess it would be a weird place to keep new toys anyway..
You know you should clean this thing, right? Cross your paws with us that Chrystal/Daily Dose/Winnie's Wish gets their internet back this morning! Remember, every bid in the auction helps them! Glitter: There's something wrong with the picture on my Bird TV.. It's called 'fog' sweetie. It'll clear up after a while. Glitter: I don't want to wait, can't you adjust a knob or something? I can't see my birdies and squirrels! I wish there was a knob or something to control the weather! Wouldn't that be nice? I don't usually post on Saturday's, but I thought it would be fun to do another Caturday Art post. I started with a picture of Leo that I posted last week. This one was called photocopy, strange name for what I got, which I think is cute. This one I adjusted the color balance until I got a purple boy! And this is my all time favorite, cartoonify! I added a bunch of new items late yesterday! So it you haven't checked out the Winnie's Wish Insta-Auction recently, have another peek! 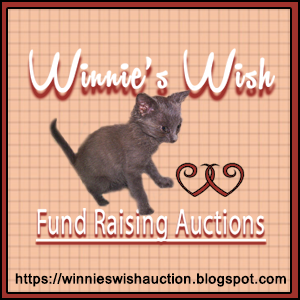 Please spread the word about the auction and help the kitties of Winnie's Wish!